Nearly every business or client we’ve ever spoken to have the struggle of getting reviews on their Google business profile. Sadly we live in a society where is it easier to get bad reviews for being 1 minute late than lots of good reviews for doing something amazing. The key to getting people or clients to review your business is to actually ask! We live in a society where you have to ask, customers won’t do things off their own backs anymore. Always remember that reviews will improve your sales because of people and Google trusting reviews. 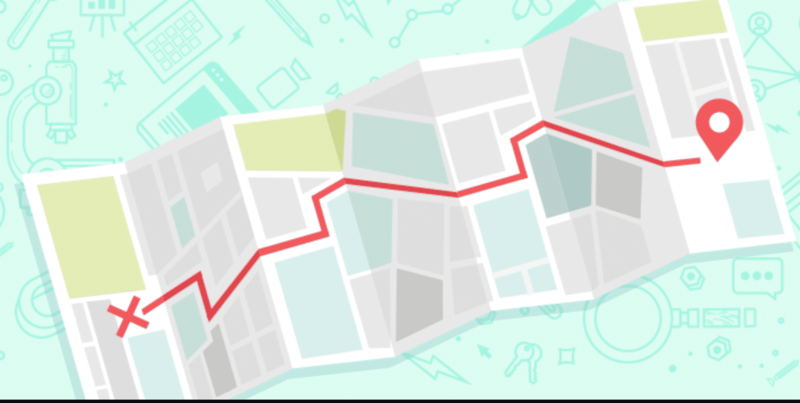 Do local business reviews by customers help SEO? We are always telling our clients to get reviews, not just for SEO reasons but because they make you look competent, professional and most of the time better than your competitors who may have the odd review from a mate. Never forget that you need to convince Google’s customers that you are better than everyone who is listed alongside your Google business listings. Remember, just because you sell a service doesn’t mean that people need to buy from you, they need to be convinced that you are the best, reviews will often beat any good or snazzy web sales copy to draw people in. Google searchers tend to jump to any business with a star rating much quicker than a business who doesn’t, its a trust and follow the crowd thing. So regarding organic keyword positions, reviews on your Google my business account will help towards your natural non-branded keyword positions; however, a well optimised Google business profile can easily outrank and outperform any competitor who may have hundreds of their client reviews. Getting clients to your Google business profile is something any business owner can do within a few seconds of your time, there is no reason not to take advantage of the free (at the moment) service. Google Maps reviews will benefit your business and outperform any other review platform on the internet like Trustpilot, Yelp or Facebook. (unless you are a social media company). Let’s face it, most searchers use Google to find something, not Yelp or Facebook. Have a look at your own Google Analytics, who sends you more traffic? We bet its Google! Let’s help you get ‘Google my business’ reviews. We often ask our clients to encourage customers to review once they’ve made a sale or purchase. We will always spot check clients every other week to see how they are getting on, but it is usually the same thing every time with a small spike of Google reviews which is clearly from their friends or family, rarely from one of their customers, so we looked into it. The old saying comes to mind which is the old faithful ” if you don’t ask you don’t get”. It would help if you made Google reviews as part of your process, or sales transactions. A follow-up in an email can easily generate you a few good reviews a month if you do it right, you may create more sales from previous customers who are happy with your service. Timing comes down to finding the line between not asking too early and not asking too late. Too soon and your customer may not have got the full benefits of your product or service and may not have an opinion on it yet; too late and that initial sense of impressiveness you incited may have faded. Asking your clients for reviews is very easy as long as you don’t overthink it! When you’re asking your customers for reviews, they will generally respond with one of the four replies below. If you try and remind yourself that you are only really going to get one of the four replies above, it isn’t that bad Is it? Just make sure you have a simple process to deal with the four actions below. If they automatically leave a review, then you don’t need to follow it up, the job is done. If they reply with, I’ll do it in a few days, leave a note in your calendar to remind them in a week don’t hassle them. If they ignore your request, don’t worry too much because this rarely happens but try and find out if there is a problem with whatever transaction. If they point-blank refuse and there isn’t a problem with your service or product, it’s ok some people don’t want to leave a review. The key to getting your customers to do something for you as we’ve covered a few times is to ask, and then you will get. As said above, don’t overthink it, don’t ask them for too much and certainly do not tell them how many words, what’s right and how to do it. Keep your life simple and their life easy, ask if they can do you quick favour rather than using the term ‘review’ tell them that it merely helps you out and you are very grateful, it is that easy. You will be asked how to review on Google. We found one of the main reasons people don’t leave a review is because they think that you need to have a full Gmail address, which hasn’t been the case for at least a year maybe two. Remind your clients that it takes less than 2 minutes to leave a review, even if they don’t use Gmail or Google Plus. Also if your customer doesn’t have a Google account it only takes 10 seconds to open one, but these days most people do, especially business owners due to things like Google Analytics or even maps. You do not need a Google review link generator. Just tell your customer to Google your brand name, your Google my business listing should show up on the right side of the search engine result. Your client should be able to click the current reviews where a window will pop up, tell them to click ‘write a review’ and the job is complete, it should take less than 2 minutes for a standard length review. Tip!! Asking people to Google your brand name over time, will help you with your SEO activities and performance, rather than giving them a link directly to your Google listing account. If you generate a lot of sales, bookings or transactions, then manually asking for reviews can become extremely time-consuming, this is often another reason why established businesses rarely get many reviews on their Google place account. A quick solution to this is to implement a process where Google review requests are applied in your sales process. All you need to do is generate a link to your Google business map profile that will take you less than 10 seconds to produce. Don’t forget that a link in your email signature can go a long way. We would advise that e-commerce stores only request a review once delivery has been confirmed, you do not want a review for a late delivery when it isn’t your fault. You do not need to use any Google review link generators at all. Just follow the steps above, search for your brand name in Google click the reviews which will open up a new tab or window then copy the URL in your web browser. You will then need to go to your email client or whatever you want to use, write a short message with the simple hyperlink which is a clickable link in the body of the text which takes your client directly to the Google review process. What business owners need to be aware of is that it is better to have one Google review a week from your customers spread over a few months, than one week of 20 reviews, then forgotten about. You do have to be consistent about your Google reviews, keep plugging away at your customers, and over time the rewards will come. Be prepared for the odd person to leave 3 or 4-star reviews, believe it or not, some people will never leave a 5-star review, However, use this to your advantage to get back in contact with that customer to see if you can resolve or maybe sell another product. All reviews can be updated or edited, we have seen reviews placed over four years ago to be changed from 3 stars to 5 stars quite easily. Never get obsessed with people who don’t leave 5-star reviews, focus on getting as many reviews as you can over time , it’s just part and parcel of running a business so focus on pleasing 80% of your clients to the max, rather than the 20% that you will never 100%, please. Always remember that Google will always ‘listen’ to your customers more than they will ever trust you! You have to educate Google and your potential customers that you are one of the best businesses in whatever niche or industry you are trading in. Google reviews are one of the quickest, cheapest and visible ways to prove that. Keep at it and reap the rewards, because they will come. Here are some of our own examples below. We have used SEOmers for many years and would highly recommend their services. Dan is always available for additional help and support to ensure that our website and social media are performing well. Clear and precise explanations of what was needed to take my site and business to the level required. Would highly recommend. They know their stuff in the digital world. Would thoroughly recommend. SEOmers have been brilliant with boosting our SEO rankings, Dan is always happy to advise on social media and website ideas and he's a super handy person to know! Can't recommend enough. We don’t really need to take tests or exams but we do them anyway. Sadly we are working within an unregulated industry so for us, its the difference between having a go and actually getting results. In our industry, it’s flooded with ‘have a go’ people so we do these types of exams (and Googles) for a number of reasons. We tend to do about 20 exams based around digital marketing each year, mainly to make sure we are tip top and not going blind in an ever-changing industry that works within many industries. Let’s face facts. We can make the most simple mistake, one that could cause a massive drop in performance for any of our clients. Our reasons why we keep doing exams and courses. Having 10-15 years experience means nothing if you stopped learning years ago. Not many people in our industry put their money where their mouth is. Dan & Fay like to reassure themselves that they are staying at the top of the game. We don’t use our clients as playgrounds for our own benefit. If anything, we enjoy doing exams to re-educate ourselves, we don’t really learn a massive amount but if we did, we would close SEOmers because it would be wrong to sell something if you don’t know the at least some of the answers right? We will not take those risks at all! Here are some of the exams we’ve passed. We love HubSpot if you’ve never looked into using it as a marketing CRM, you should at least take a look, it really can help your business if used right. Yes, we can help you make the most of it. Would you like a chat about it? We are also certified, partnered and qualified with Google themselves. We are not awarded by paying an entry or subscription fee. It is more than just passing a couple of exams, you have to PROVE what you can do, and have a proven track record that is verified by Google. Any marketing company, large or ‘one man band’ that runs or manages an AdWords or a marketing campaign can attempt to qualify to earn a Google partner badge, free of charge, no strings or entry fees. You learn your trade and have a good track record of “getting your clients results, then take exams”. We have done this for the last four years! So there you have it, we don’t just have amazing Google reviews and references from banks, charities and business owners. We are also one of the very few companies in Suffolk who openly go out of their way to stay educated and tested frequently. We are proud of this fact. Over the years. We’ve worked with hundreds of business owners, contractors and marketing directors before launching their SEO campaigns. From household brands to local insurance, doctors, tradespeople and accountants. We have shortlisted five things that keep cropping up, but in most cases, they are not SEO Tips, they are myths and nothing more. If anything, these are ‘tips’ that could ruin your online income. Our job is to teach our clients about what moves the gauge from a performance perspective and to erase the theories from their minds that will have minimal benefit to their business. So you have a new website without any traffic. You don’t have a clue what to do with it after discovering that your newly designed website isn’t getting any traffic or showing anywhere in a search engine. It happens a lot but just having a website will not bring customers. You have to get them. 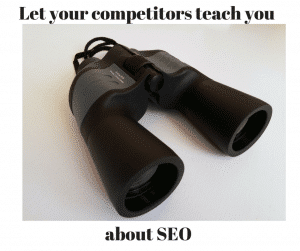 You then do the same as 90% of any other website owners, you start Googling about SEO, getting traffic and often swamped with outdated advice and tips. One of the ‘tips’ you will see over and over again is the importance of using business listing websites like Yelp, Scoot or Freeindex. We are not going to discuss the value or importance of having a listing on any free business listing but we will say that most free listing websites will not have any value towards your own SEO or keyword rankings. You really shouldn’t download massive directory lists from the internet and submit to them all, you won’t have any issues (in most cases) but you will waste your time. Being a business owner is about using your time wisely. There is nothing wrong with submitting your website to any free business listing but choose the right ones. How do you know which business listing website is the right one for you? It is easy; you have competitors who have already done the work, you just need to find what they’ve done. The next question is how do you find the websites where your competitors have been placed? The truth is, most site owners don’t have a clue, they download lists that hold no SEO value at all, and give up at number 32 out of a list of 998 directories. You now have the upper hand if you are reading this. We see a lot of websites, what they are up too and where they have either been mentioned or placed a reference to their business. We have sourced, filtered and tidied up a list of over 100 of the most popular and free UK Business websites that everyone seems to be using, we removed any listing sites that are simply dreadful. We then used Google to build our own mini search engine. The ‘search engine’ below will only search these free business listing websites. 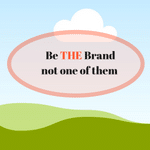 If you see that your competitors brand is listed on something, and you are not – Get listed. We’ve done the hard work, you just need to get listed alongside them. All you have to do is enter your website or your competitors site, if they are listed then submit your own business. We are aware this isn’t perfect but we are using a free but customised tool from Google. We can only show you 10 results per page. We tried to bypass to show more but Google won’t let us. Google could disable this at any time so if you are going to use it, take advantage now. Google will sometimes show the same website more than once, just scroll to the next page. We are only searching business listing websites that might have some SEO value, being listed doesn’t mean you will rank in Google, SEO is more than a few business listings. We will keep this list updated if we feel a business listing website is turning into rubbish, we will remove it from this search engine, just the same if we find a new but popular listing website, we will add them to this tool. You might not consider yourself a ‘brand aficionado’, but chances are, you’re fooling yourself. Every time you search – no matter what you’re looking for – Google comes up with a list of sources it thinks you might be interested in. Regardless of SEO – regardless of all the keywords and all the meta tags in all the world, if you’re represented with a brand or a name you recognise, you’re probably going to click on them first. Go ahead – deny it. This is important to bear in mind from the other side of the playing field. If you’re a small business, how would you suggest appealing to your public through basic SEO? Sure – it’s a start – but if you’re going up against big boys in your trade or in your line of expertise, you may as well throw up the white flag now. Throw that in with what’s happening to Google searches as of late – oh, yes – they’re changing again. Recent data shows that Google is changing the game, albeit in a different way to their usual algorithm shifts. While simple search queries may have previously brought up small, independent entities and blogs, broad terms are being met with bigger fish, trusted sources, informative articles – all in an effort to help make finding the right answer that little bit more efficient. This also means that – with the dawn of the knowledge panel – you know the ones – searchers are being given the answers they need without actually needing to click anywhere. This means that you’re going to take a further hit. Industry boffins are predicting that the click-per-search percentage is set to dip from 60% to below 50%. In layman’s terms, this is very big indeed. This means that Google is keeping more and more searchers on-page – and unless you do something, this means smaller fish like you are going to get less and less chance to impact upon the public. In this day and age – with Google evidently (and very clearly so) putting algorithms together to help searchers find answers easier than ever – and with these knowledge panel changes and the drop in click rates, it’s getting harder for smaller businesses to stand out against more recognisable names. This why – while basic SEO and all the bells and whistles are still HUGELY important (let’s not forget that), you’re going to need to focus on your brand, too. Perhaps more so than ever before. The game’s changed. It’s no longer enough to be, say, an ‘affordable painter and decorator in Penge’. You’re going to need to be THE painter and decorator in Penge that Penge searchers are going to immediately recognise and trust. It’s all well and good getting to the top of Google’s holy search ladder, but without that sense of brand – that recognition –, you’re doomed to get cast aside. Especially when the searcher might not even need to click on you. It’s all about increasing your chances. So – what now? How do you combat Google’s search streamlining – and the bigger fish? Firstly – once again – don’t ever discount basic SEO. It evolves, it works, it brings necessary results for businesses time and time again – and it conquers half, if not two-thirds of the battle. That last little stretch is going to be all about getting your name out there in different ways – being your brand. Developing a unique identity. Be the go-to guys on social media – your clients are all over the internet, you need to get them to your website. This is where your traffic will feel inspired – and once they search, they’ll remember you. Lead with simple, straightforward branding and marketing – dump the clichés and the same old spiel. No one wants to hear it. Take a look at yourself. Your brand. Would you be inspired to click if your result came up against, say, a world leader in your trade? Maybe not – meaning it’s high time you shouted your brand, your ethos, whatever you’ve got – from every soapbox going. Show people who you are – build that image – and let them come to you. Don’t panic – but do be smart about branding, and be smart about it now. So – the latest news from Google HQ is that they’re more focused than ever on making sure that the search experience for everyone isn’t just as relevant as possible, it’s as safe as possible, too. 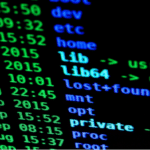 This has led to greater engagement, reportedly, with website owners through their Search Console, and a major clear-up of ‘hacked’ sites which appear to be pushing useless spam content. It’s all done in the name of the greater good – the engagement that Google is talking about is that they’ve approached site owners who update regularly with warnings regarding certain factors that could impact them negatively in search results. That’s nice of them – you’re probably thinking – but it’s worth bearing in mind that, unless you’re regularly updating your web content (via blogs, tweaks, etc), Google is probably going to forget you exist at all. It seems to be the Big G’s collective opinion that legitimate sites which update regularly are worth paying attention to – it makes sense, in a way – as the longer you leave a site unmanaged, the less relevant it’s going to be. An untouched site is one which is going to look uncared for – and how is your potential traffic going to see that? Not in a great light – so it’s not surprising Google runs with this ideal. What’s more, if you’re negligent with your website to the extent that it is regularly hacked or completely over-run with spam or worse, Google will simply wipe your results clean off the grid. That’s pretty much the worst case scenario for anyone looking to retain a foothold online, we’re sure you’ll agree. Google are also actively approaching webmasters who are failing to adhere to the engine’s guidelines – which, it can be assumed, has helped them in eradicating ‘more than 80% of compromised sites from search results’. It’s safe to say that just staying active isn’t enough to remain in favour with the Big G – you’re going to need to pay attention to what they deem fair and legal content, too. Google are head-on spam fighters at present, but it’s worth remembering that the giant won’t see you at all if you fail to regularly maintain and update your website. Let your audience know you’re active – make changes to your site. Regularly update your security standards – converse with Google – and let them know you’re alive and kicking. Getting the right sort of attention from Google isn’t hard, but it’s going to need your interest as well as your investment. Sounds pretty neat, doesn’t it — but what does it mean? Well for one, SEOmers gets to have a special badge on the site. However, it does offer much much more than that. Earning Google’s Partner badge means that we are an online company that’s trusted by Google directly, trained and accredited in Google’s best practices. Any marketing company, large or ‘one man band’ that runs or manages an AdWords or a marketing campaign can attempt to qualify to earn a Google partner badge, free of charge, no strings or entry fees. You learn your trade and have a good track record of “getting your clients results, then take exams”. We have done this for the last three years since SEOmers has been running. You can check for yourselves, but we’re one of the Most Qualified & Certified marketing companies in Suffolk, according to Google themselves, feel free to check! Google has refreshed its guidelines advising users that failure to remove expired job postings may result in a manual action Google penalty. These guidelines relate specifically to job opportunities that have been published to a website using job posting markup. The new guidelines should not affect URLs/Pages for job opportunities that have not been marked up with structured data. Remove the JobPosting markup from the page. Remove the page entirely (so that requesting it returns a 404 or 410 status code). Add a noindex meta tag to the page. Ensure the validThrough property is populated and in the past. When a job posting is filled, recruitment firms can avoid Google penalties by either: removing job posting markup, removing the whole page, or adding a no-index tag to the job posting. The easiest is just deleting the redundant position. Some will argue that a manual action is an extreme measurement to take against outdated job postings. However, this will help prevent searchers from finding and applying for roles that are no longer available. This also asks the question — if there’s no deadline indicated on the job posting, how will Google know when it’s lapsed? Google would presumably have to rely on its users to report expired job postings. The search quality team would then have to verify somehow that the job post is not available anymore. On the one hand, this could limit the number of expired job postings that show up in Google Search Results. On the other hand, this sounds like a problematic guideline to enforce. So while we were waiting for our bank to call us back about a payment. We decided to do the same as 4,400 other people do every month, in Google.co.uk, we searched for ‘Suffolk News’. We found EADT to have the prominent results but while on the site, we were redirected to App Stores and strange looking websites. We were quite surprised due to EADT being so well known, you could argue that it is ‘Suffolk Main News Paper’? In the terms of ‘SEO’ – Being redirected, without a valid reason is SPAM and very much against Googles own webmaster guidelines. You can read about that in the link at the bottom of the blog. We decided to have a look to see what was going on, EADT wouldn’t add spam and add shady code on their website, would they? Why would they do that? We discovered that EADT are very much tracking you, and sharing that data with over 60 third-party websites, while also using ‘sneaky redirects’ which is something Google hates, along with anyone who is annoyed with being asked to download the latest dating App, even if you are married with two kids and a dog! So with our findings, we decided to have a look at the top 9 results in Google for the keyword search ‘Suffolk News’ to see who else is tracking you and how much of that data is going to third-party websites. BBC Suffolk is at the top result in Google.co.uk. BBC only have two types of trackers on their Suffolk section of the website. This is more than acceptable. They know how many people come to the site and where from, simple but good data. Their main tracking is Google Analytics which is very much the standard for any website on the internet. The second two results in Google is eadt.co.uk/home and their eadt.co.uk/new pages. We found the website to be very slow on an iPhone and a MAC/Laptop. We found that if you are using a mobile device, you will end up being redirected to a website that tries to force you to download an app etc. We found EADT 77 trackers on the website with three of the tracking codes being extremely insecure. One of the most concerning tracking codes is eXelate which buys and sells data to various sources. Ipswich Star is within the same group as EADT. 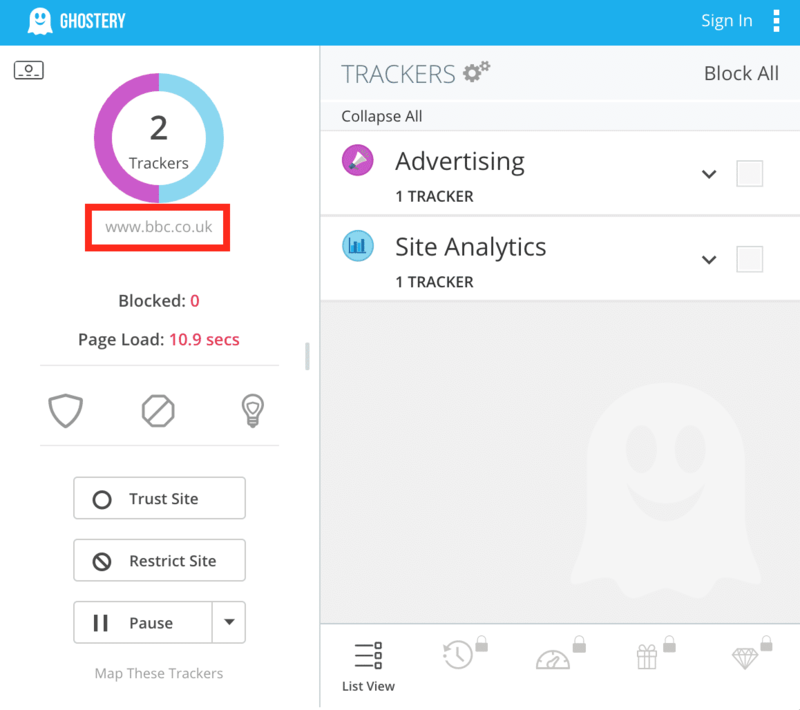 We expected this website to be flooded with third-party tracking in the same way. Ipswich Star doesn’t appear to have as many tracking codes as their mother site but it is still an extremely high number. We also found two of the tracking codes to be insecure. We also found some tracking codes that are linked to websites that buy and sell data. We also double checked the website in their news section of the website, we recorded over 100 tracking codes on that one page. We were pleasantly surprised with ITV Anglia. We expected them to be flooded with tracking codes because they are paid for by advertising. We found the industry standard of Google Analytics which is expected. ITV has barely any real tracking on the website at all. 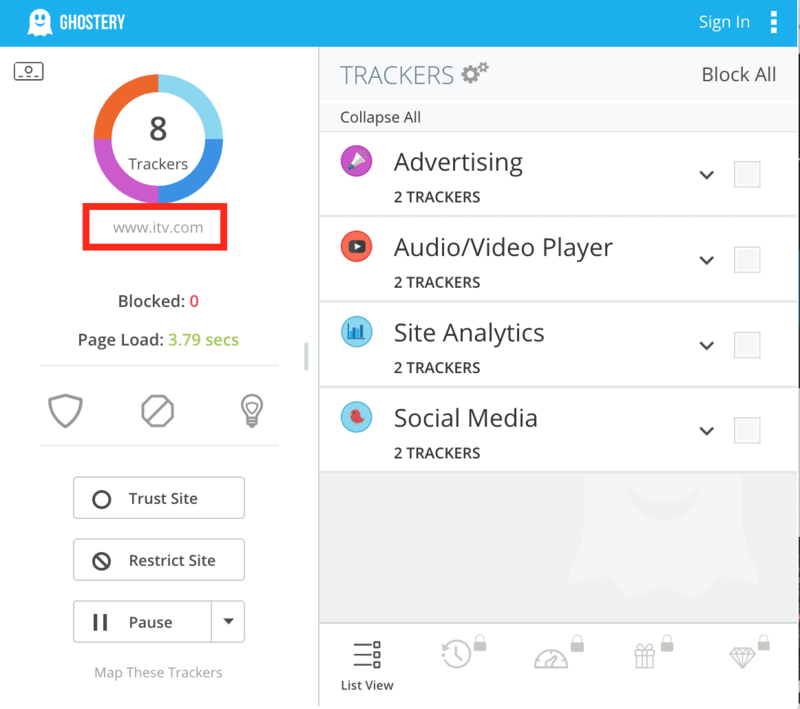 We only found two trackers that record traffic with just two others related to advertising. The remaining four codes were related to having social sharing buttons or video players. We only listed Suffolk Constabulary because Google ranking for a news-related term. However, we can safely presume that its one of the most popular news type websites around for crime or campaigns. We expected Suffolk Police to have a lot more tracking and data filtering services than we thought. We only found eight with four of the tracking codes being related to Facebook. We would presume Suffolk Constabulary would use social media to their advantage, if a crime happened in Sudbury, they can easily target people within 10 miles of Sudbury while not including unrelated people in Ipswich. 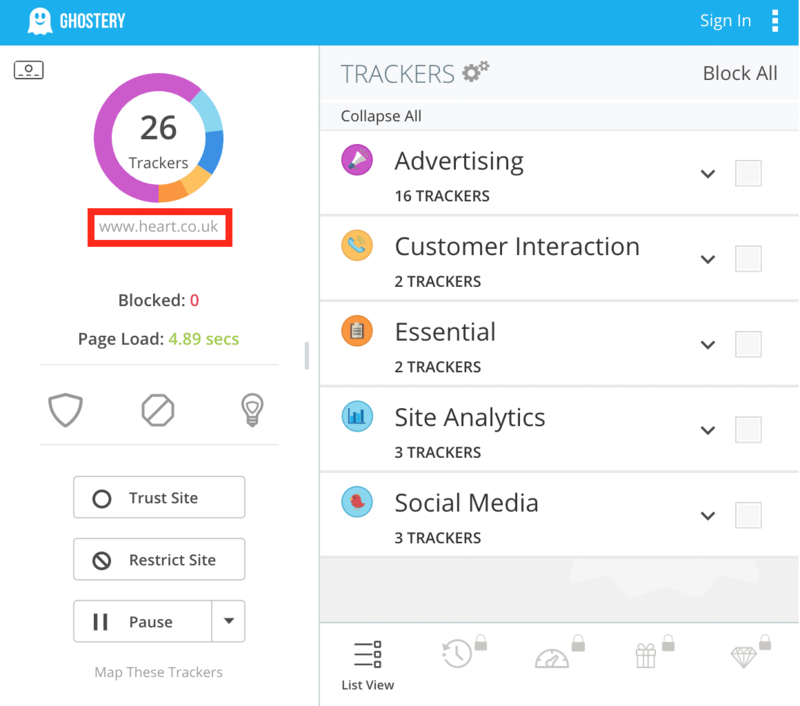 Independent Suffolk has over 63 types of tracking codes on their websites. 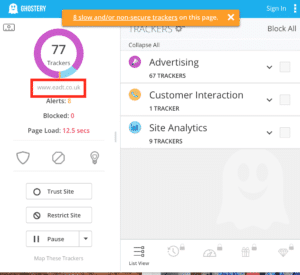 We looked into what type of tracking they have, most of it is related to selling advertising space, one of the most known tracking codes is called ‘BlueKai’ who have been accused of invasion of privacy more than once. Independent are also using services such as ‘ScoreCard Research Beacon’ which is a well-known service that records anonymous information about users so websites can improve their content etc. Heart is using 26 tracking codes on their Suffolk section of the website. We have found that this website is not classed as ‘secure’ because they are not using something called HTTPS. Banks, Police and Google have all stated that websites should be using SSL/HTTPS. Heart appears to be gathering data so they can build up a database of user behaviour, it appears they are focused on tracking people who are classed as ‘buyer intent’. Heart do sell advertising on the website so we expect third-party websites to be sharing Heart’s data so they can show adverts of interest to a user. Please don’t get us wrong here, we love data, we love tweaking and playing with websites to make them perform better for us, clients and their users. We believe using website data in the most ethical way, we don’t even store personal data other than ‘hits’ to our websites which will record the data in the points below. 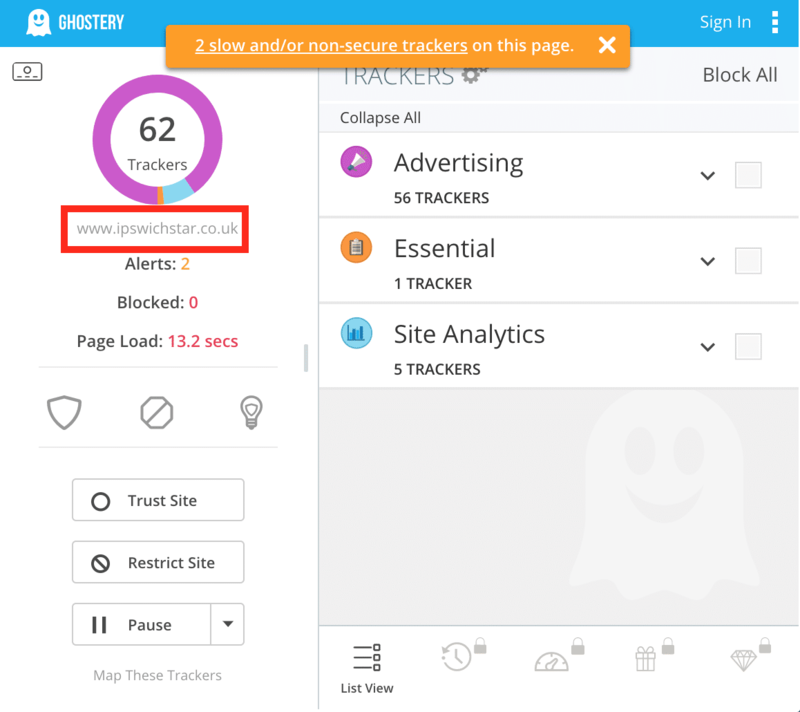 There is no real need to install tracking code over tracking code, there is no reason at all to send anyone to a third party website without the user actually knowing, and agreeing. Where those hits have come from, such as a search engine or social media. What web browser they are using, mostly so we know a website looks and performs as it should. We don’t record IP addresses for more than 30 days – We have no need for it unless it is from a spammer and we will simply block it. 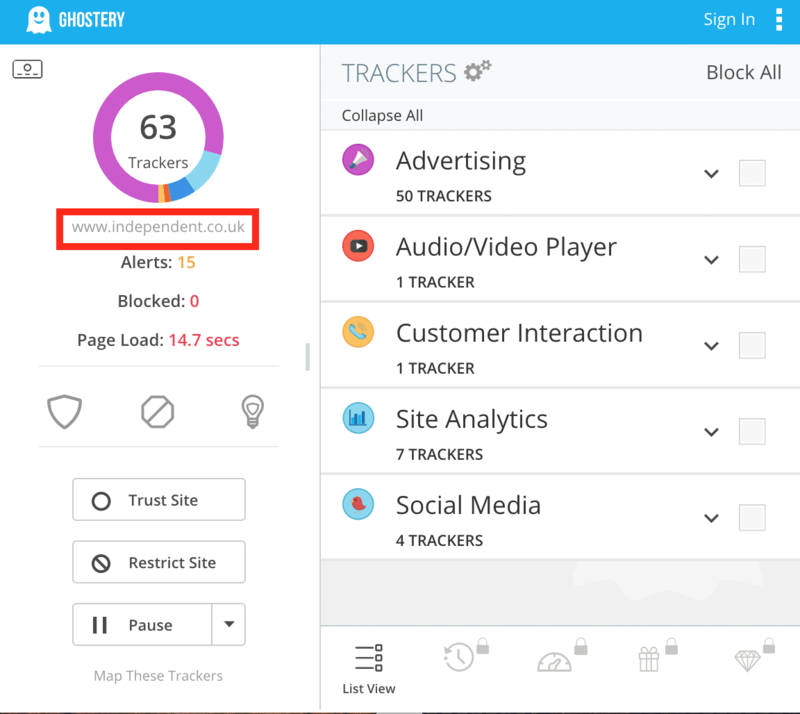 There is nothing wrong with tracking website users at all but there is a very fine line between tracking to improve a users experience and stalking them. We all need to question websites about data, how they track, store and use it. 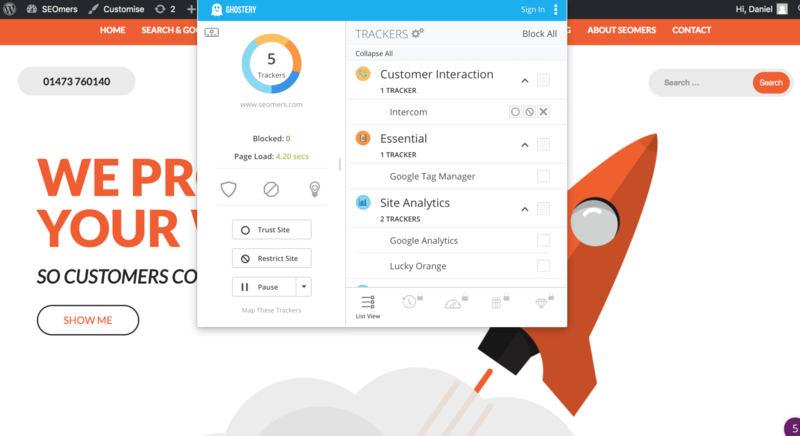 p.s SEOMERS use five tracking services on our website. Two are related to Google Analytics, Two ‘live chat’ codes which is more of a chatting system rather than ‘tracking’ and the other is called ‘Gravatar’ which is a WordPress feature for people who may comment on our blogs, so they can use custom avators. Have you found yourself looking at your competitors, trying to see what they provide, are they selling something that you could too? Is your competitor’s website is much larger than yours? Are you always finding them in search engines more than your own? Maybe they are telling you that business is great but only started to trade six months ago? Not everyone has a budget for tools or an SEO consultant. Once a month we will be providing simple guides that will help you get your SEO performing better. This month we focus on how to research what keywords your competitors might be using. Here is a trick that anyone with a computer, basic Excel skills and a spare 10 minutes can use to find out what keywords a website is targeting in Google, find content for your own ideas or merely compare your websites. Use this data so you can get an overview, tweak your website, do not just copy them, that is theft, not research. Step Five: Extract the MetaData of the pages. One of the many free tools is this website. At the bottom of the page, you will have the option to download a CSV file. Now you will have the competitors data. Use your imagination — there’s a lot that you can do with this information — Find keywords you could convert into traffic, get blog ideas, find special deals you didn’t they offer! Some quick tricks to sort the data into digestible chunks. Some sites still use the meta keywords tag to keep track of keywords, which gives lots keywords in the CSV’s “Meta Keyword” field to work with straight away. Title tags are a great place to start looking, they frequently contain keywords that they are targeted for Google search rankings. It’s extremely common for title tags be formatted like this Buy Red Dresses | We’re the #1 Dress Company! Keywords are normally included in the URL split by dashes in most cases. Arguably a keyword in the page URL is more important than the title tags. Note: If the domain you downloaded is not a .com (a .co.uk or other TLD), change the “.com” in either of those to your competitors TLD.